Our first Christmas in Germany! We haven't enough money to exchange gifts or buy extravagent decorations, but we cooked a full (vegetarian) Christmas dinner with roast spuds, Yorkshire pudding, and sage and onion stuffing and gorged ourselves on chocolates and booze in the traditional English way. Not so traditionally English, instead of crashing out on the sofa with a tin of Quality Street to watch the Sound of Music, in the evening we went to the Staatsoper on Unter den Linden to see a performance of Mozart's The Magic Flute (Die Zauberflöte). The view from our seats in The Gods was pretty crap, but then we'd only paid 17 Euro each for them, and what would you pay at Covent Gardens? Otherwise, the production, stage design, orchestra and singing was excellent. I particularly enjoyed the Queen of the Night's performance, so difficult to sing to perfection but this singer hit the high F6's with exhilerating precision. The guy who played Papageno was also noteworthy, sprinkling the standard text with ad libs and generally camping it up so he reminded me of David Walliams. The set had a strong Egyptian theme which fitted well, and some nice innovations, such as 'the three ladies' being disgorged by a three-headed serpent at the beginning. If you don't analyse the Elightenment and Masonic references too much, The Magic Flute is basically a traditional pantomime ("Where's Monostatos?" "He's behind you! "), and with this performance they even threw in a pantomime unicorn (and Horus, and crocodiles etc). A magical evening, albeit marred by poor views of the stage, topped off with after-show Glühwein next to the ice-rink on Unter den Linden. It's the week before Christmas. What better time then to go to church and listen to mediaeval music chanted in Latin by guys dressed in robes? Hmm, and with six bagpipe players, gargantuan drums, lots of luting, and squeeky pipes please. Tonight we went to see Corvus Corax perform their reconstruction of profane mediaval music at the Evangelisch Passionskirche on Marheinekeplatz. 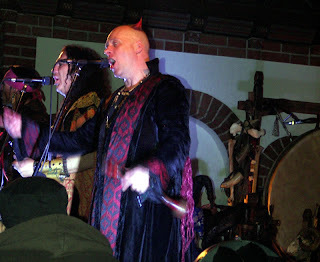 I'm not sure Martin Luther had in mind places of Christian worship being given over to a band of bizzarely dressed and sweaty tattooed men led by a guy named Teufel (Devil), but never have I seen a church congregation so happy-clappy (and stompy-jumpy). Cliff Richard should be so happy for this reception. The audience seemed an eclectic mixture of young musicology students checking out the authenticity, puzzled looking goths, beardy middle-aged Womad types, and people dressed as if they were on their way to the Crusades; the CC groupies I guess. And us; we're totally normal of course. As a spectacle it works perfectly, and audience and performers interact as one in buying into a mediaeval travelling musician folk mystery-play kind of thing. Only a few fire-eaters, tumbling dwarfs, and people on stilts seem to be missing. But then there are only so many notes you can get out of a bagpipe or chanter whilst the drum-beats repeat the same beat and the harmonics reach again the diabolical thirds, and after a while each set-piece starts to sound like the last. We left them dancing in the aisles and hummed the latest hit from the thirteenth century on our way to the S-Bahn. It seems like Leonard Cohen's 'Hallelujah' is going to make the British Christmas charts as number one and even number two. And here's a link to Jeff Buckley's version which was actually used in the film (and let's face it, Cohen can't actually sing very well! ).